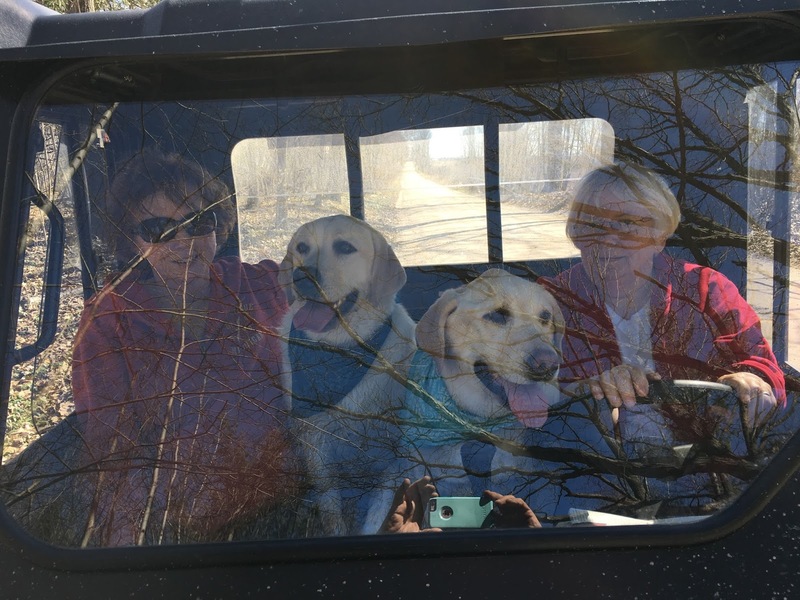 Last Saturday afternoon, we loaded the Girls into the truck, threw a couple of shovels in and grabbed a cold pop for the ride. Taking the back roads, well, I guess that's about all there are is back roads from the Lane to MaMa Kay and Bernard's Forty. We love back roads. At one time the Forty was blessed with a home. We can tell by the remnants of the foundation that remains. We wonder, MaMa Kay and Me anyway, what might have happened that the house no longer stands. We also think about the lady of this former home and how myrtle must've been her choice for planting. Maybe just a couple foundation plantings. Many years ago for sure. Myrtle multiplies. I'm sure the lady never dreamed a couple little plants would now be acres of myrtle surrounding the foundation of her former home. MaMa Kay came driving the Ranger, loaded with empty pans.....pan of every size, style and color, even a blue swirl granite one. Bernard was already digging clumps of the beautiful green cover and filling the pans. Wayne joined in the digging....as did I, for a minute. Then MaMa says, "get the Girls and we'll go for a ride".....and oh my what a wonderful ride it was! Over the trails and through the woods. Past the many beautiful ponds, a little culvert stream and oh my the wonderful big rock piles! This was a Ranger full of very happy Girls for sure! Following a week of some very sad days dealing with our Sophie, she's next to MaMa, and her newly diagnosed illness, this was an afternoon of joy. For Sophie I know as she was so happy as she ran the wooded trails and splashed in the waters edge. For Ivy just because she loves any adventure, most especially when it includes water she can plunge into. The joy most especially filled my heart as I watched Sophie enjoy this beautiful day....and I know it filled MaMa's heart as well. I smile each time I think of MaMa Kay clutching the Ranger wheel around the curves and through the little valleys......while exclaiming "makin' some memories, makin' some memories". The Girls walked, talked, ran, splashed....laughed and I did dig, a little. Memories, wonderful memories were made by All. Thank you MaMa Kay and Pops Bernard....for the big truck load of myrtle and the help with the digging and loading. For the walks, talks, rides and laughter. Thanks for makin' some memories oh so dear to our hearts. And thanks Lady of the House for planting the myrtle. Your writing always stirs my heart. Finding heartfelt joy in simple pleasures is what life should be. Such joy does not feel simple but overflowing. Such a wonderful post! Thank you Linda.....makes my heart smile to know my words reach into yours and leave an impression. Finding joy is easier than most make it.....for sure the simple things. Take good care and thank you for your sweet comment.